$45.00 "River Crossing Operations", dated 1927. By the State Publishing House. Shows diagrams and drawings. $195.00 Red Army Nagant Revolver / Tokarev Pistol Manual, 1940 edition. Titled "Shooting Operations Instructions NDS-38: Model 1895 Revolver and Model 1930 Pistol". A very uncommon early WW2 manual in excellent condition. $125.00 Red Army M-43 PPS Submachine Gun Manual, 1944 edition. Titled "7.62 Automatic Weapon (Machine Pistol), 1943 Model". An uncommon WW2 manual in very good condition. $150.00 Red Army Field Fortifications Manual, titled "Fortifying the Terrain", by the Voenizdat Military Publishing House, July 1941. This very uncommon early hardcover edition from the first days of the Patriotic War contains massive number of illustrations and diagrams. Printed in Leningrad just weeks before the city was completely blockaded by the Nazis. In excellent condition. $90.00 "Red Army Infantry Signals for the Bugle," Military Publishing House, 1941, official manual with twelve tunes for regimental buglers to play. $75.00 "MPVO [Local Antiaircraft Defense], Manual for Local Antiaircraft Defense", published in Leningrad just prior to the German invasion in June, 1941. In good condition. An interesting selection of books that Soviet citizens read or referred to in the course of their lives can be seen in the Vintage Soviet Literature section of our website. $95.00 "German Armored Portable Pillbox", Red Army Manual, October 1943. Prepared by the Staff of the Red Army Corps of Engineers based on German pillboxes captured in the wake of the Battle of Kursk and Soviet summer 1943 offensives at Bryansk and Kharkov. In very good to excellent condition. 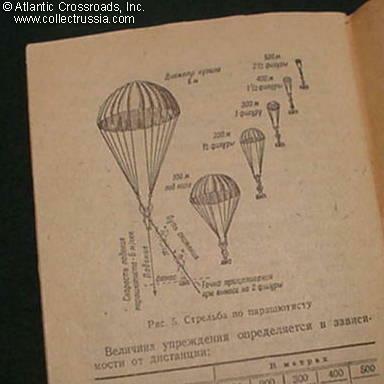 $39.00 Medical Supplies of the Red Army manual, 1945. $65.00 "Instruction for the Officer Staff of the Red Army, Individual Gymnastics for Every Day, (Second Edition)," 1945.